Jim and his family live happily on their remote outback station. Yet, sometimes Jim feels lonely. Then a strange new radio with pedals arrives and Jim's Mum and Dad can send messages to their neighbours. Jim wants to have a go! 'When you're older,' says Dad. Then something happens that only Jim can deal with. Will he learn how to use the radio in time to save Dad? 'Radio Rescue!' is a beautifully illustrated flap book that takes us back to the origins of communication in the outback, with fascinating factual information at the back of the book. A sister book to the award-winning 'Tea and Sugar Christmas', with the same author and illustrator. 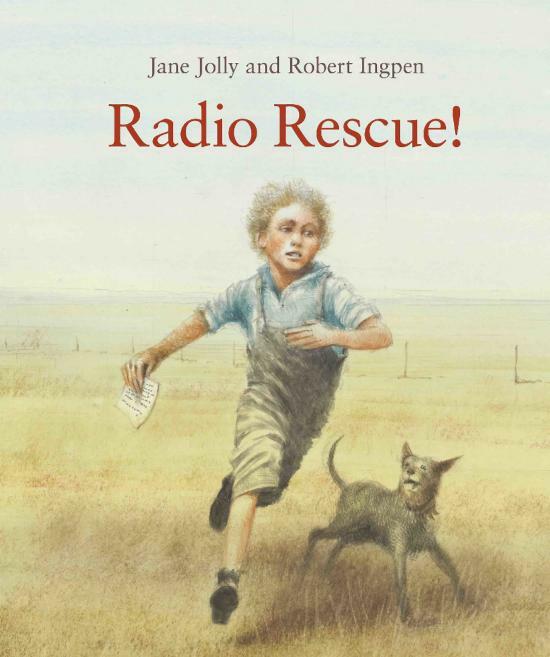 Jolly’s text is simple and uncomplicated, making Radio Rescue accessible to young kids as a book to read, but nevertheless it packs an emotional punch. We read about Jim, Dad and Mum living on a remote Australian sheep station in the 1920s. Life is difficult, not least because of the loneliness and worry about possible accidents or illness, with no way of urgent communication. When the family finally gets a pedal radio, their world bursts open with possibilities. Then Dad is thrown from his horse, and Jim must step up and use the radio to save his dad’s life. I always love Ingpen’s art work and it definitely enhances Radio Rescue. There are very detailed black and white pencil sketches and full colour pages, both authenticating this period of time and place in Australia’s past. In typical Ingpen style, he captures action, mood and character in a seemingly effortless way. Some of the pages unfold, displaying that illustration to great effect. Radio Rescue makes a very special read-aloud, but I think schools will grab it as a resource to enhance the Australian Curriculum. Apart from the fact-based story, there’s an addendum that includes images from NLA, and text explaining the facts about radios in the Outback. Radio Rescue is an excellent book worthy of collections everywhere.